I bought this from a Craig’s List ad. When I got home I put strings on it and I’m not impressed. No wonder. Looking at Ed’s book, I see that these were outsourced to Harmony or the like during the war. This was a $300 lesson for me to do the research before I buy. Anyway, I’ll add it to the data base. 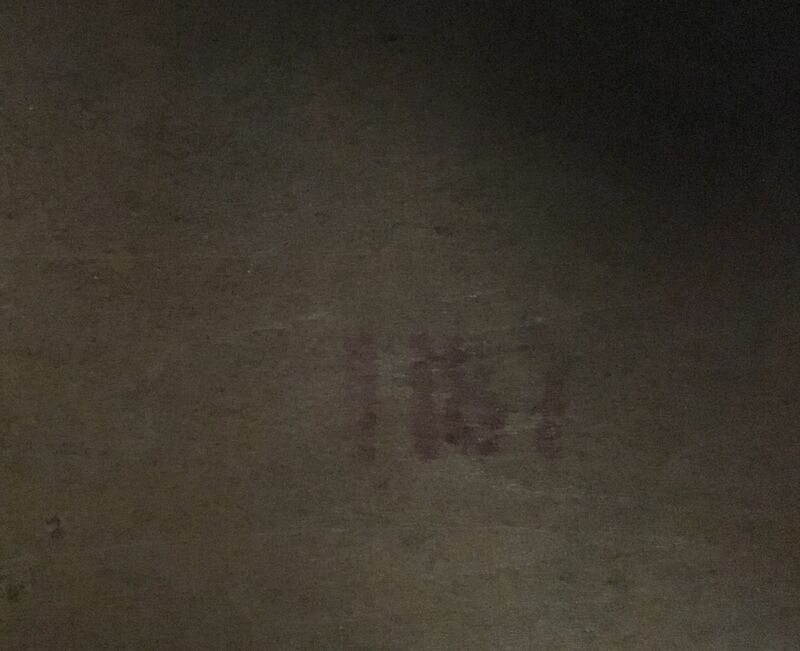 The serial number is 1187. Perhaps the most interesting (to some) is this (supposedly) original case. Why “ Brooklyn - Chicago “ ? It's still very cool, though. Thanks, Dave. I needed that. Maybe one day I’ll have a museum. 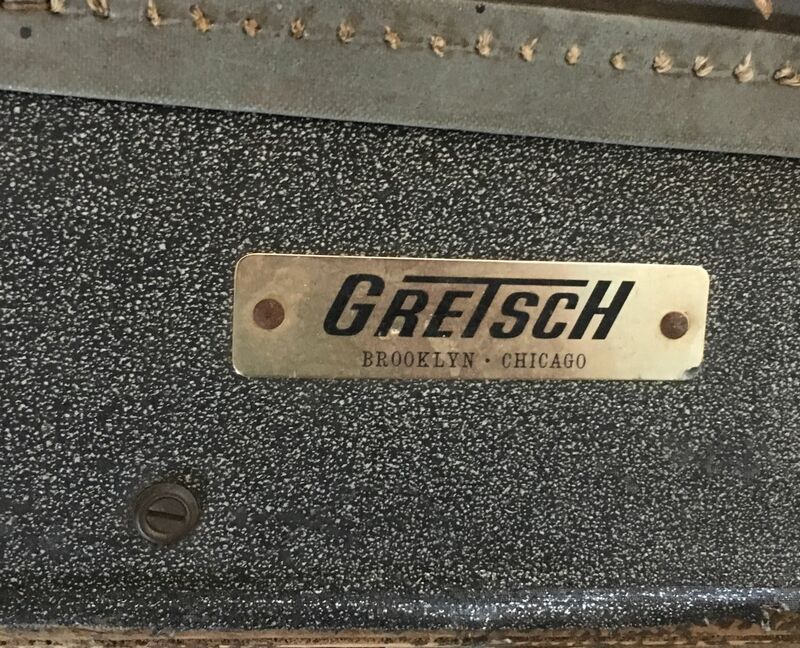 Gretsch's sales division was in Chicago (IIRC). They started using those badges around '63. Not too bad a score for $300 -- with the case. Question Bob, what strings did you put on it? I ask because archtops need at least medium gauge to move the top properly. When I got my '41 Synchro I put med bronze on it and while sounding fine, being round wound they were very noisy moving my left hand on the gretboard. Changed them for medium D'Addario flattops which are very quiet but still give the nice tone, being phosphor bronze. BTW, archtop.com puts round wound PB on all the guitars it overhauls. Gauge is the key though. On the other hand, that NY might just not be a good guitar. Thanks. I feel better now. I put D'Addario phosphor-bronze 12s on it like I always do, for comparison. 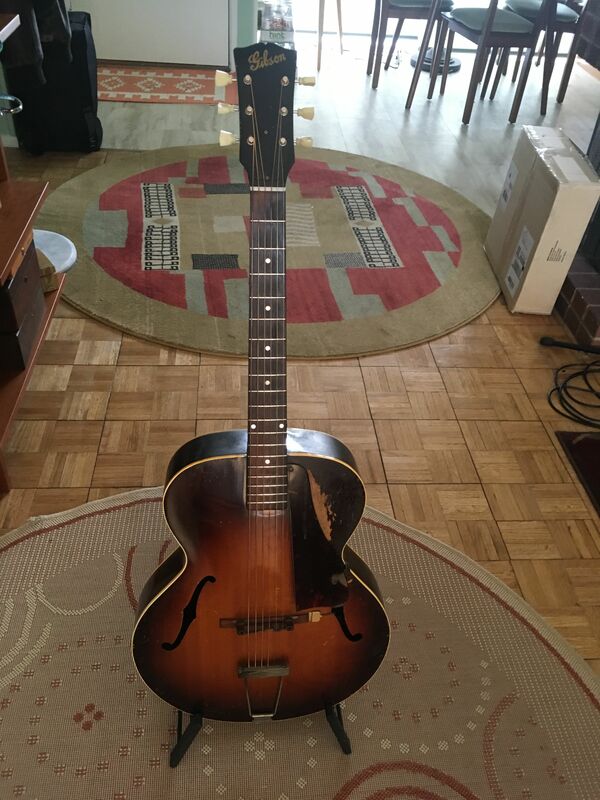 It doesn’t hold a candle to my good old 1946 Gibson L-48. Not a fair comparison, perhaps. I was hoping to get a Gretsch version of the Gibby. I was, of course, dreaming. It’s all real bindings and block markers. No rot. Bob- It still looks cool! I always like block inlays on acoustics. 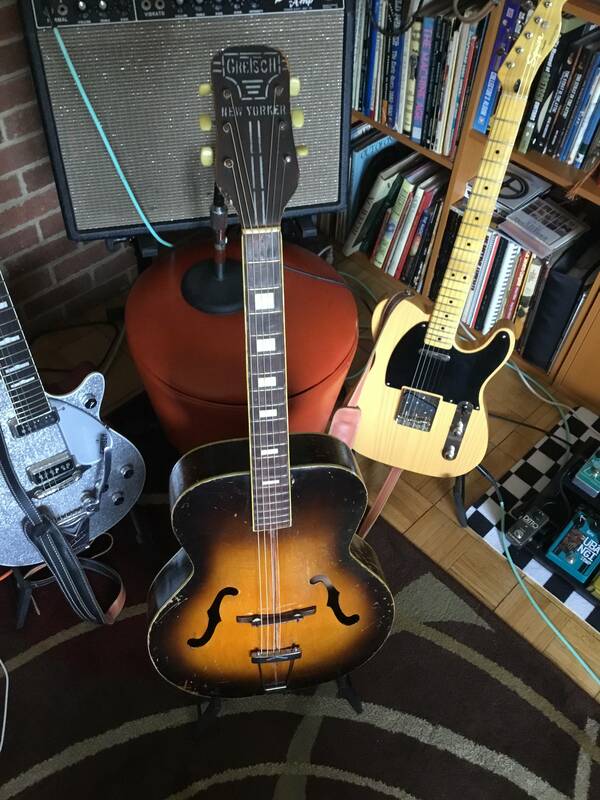 $300 isnt a bad deal for a "vintage" guitar. Considering that you got a cool old guitar , with history ,for the price of a boutique pedal or a pair of new pickups ,not bad. Did I mention the big old crack down the front? The crack is quite stable and it’s been glued sometime in the dim and distant past. Do you still think I got a good deal? Are you sure it's a crack Bob and not a two piece top coming apart? I don't know the entire situation with this model - carved or laminate top - but I tend to think Ed told us awhile ago on another New Yorker that they're laminate, which would make for a crack. Is the top spruce or maple? Looks like it’s spruce laminate comming apart, Dave. That's better than a crack Bob! The carved top on my Synchro had the same thing, very slight but only for a short distance below the tailpiece. My luthier cleaned it up to take away the dark look to it but otherwise left it alone. Not an uncommon situation with vintage archtops due to the wood shrinking with age so I wouldn't overly worry about it as the wood is stable by now. One other thing you might check to improve the tone you report as unimpressive, is the nut. You've put on 12's and I'm thinking they may not be properly seated in their slots. If they aren't, as you know, they won't perform as they should. See if the slots need a bit of filing. I don't know about the case being original. Vintage to be sure, though. 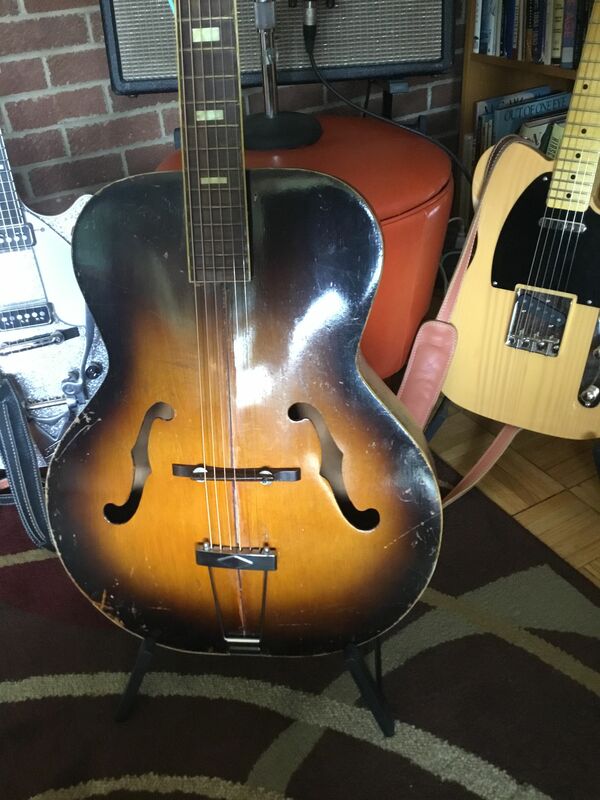 The original case I have for my Synchro is similar to other vintage cases for these older archtops I've seen and this one looks like it's for an electric Gretsch. The older archtop cases narrow in much more for the neck area and flare back out for the headstock area. Similar to a cello case. This is not really a Gretsch built guitar. During the war Gretsch outsourced these to Harmony or Kay or someone. It sounds just like these old, cheap guitars I’ve seen at yard sales. I’m not expecting anything more. Hmm, I think the original poster said this.. My first guitar was a Harmony probably from the '50's. Had the painted on binding. If it were my guitar I'd put a set of Pyramid acoustic bronze on it. D'Addario's only wish they could be as good a Pyramid's. Pyramid's are made in Germany using considerably better materials than U.S. string makers use and they last 5-6 times longer. 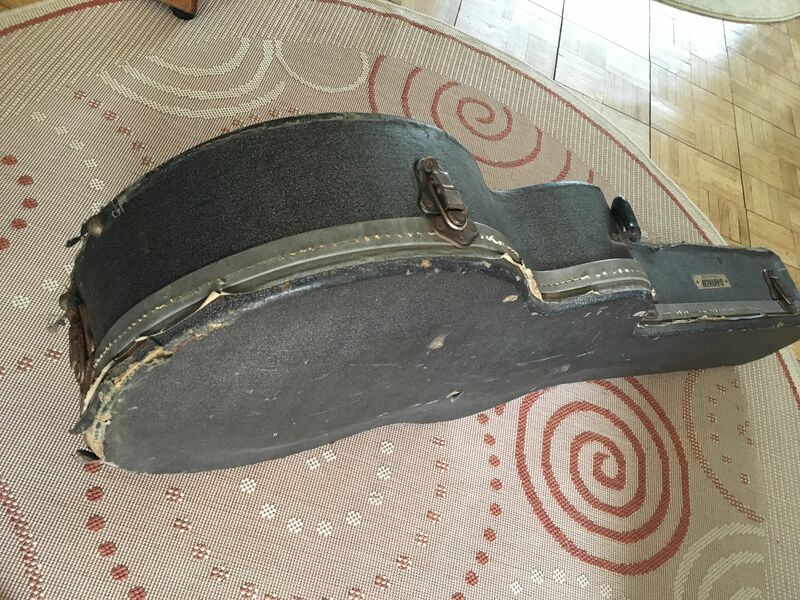 You can have the case and the guitar for three hundred obo. I’ll even swallow the postage. Or maybe I can bring it to Kingston on May 12. It works solidly as a case but can use some glue.